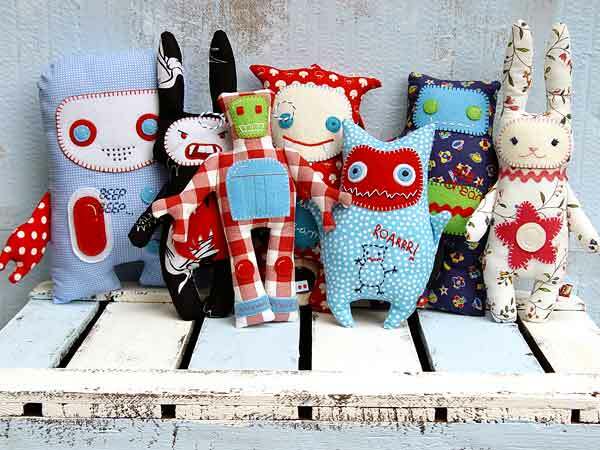 Find stuffed animals crafts, soft toy patterns for kids and stuffed animal dollmaking idea here. Stuffed toy is the favorite of almost every child, be it a boy or a girl. Not only for playing, they can also be used for decorating your house as well. According to Japanese tradition, a white snake is believed to bring wealth and prosperity. So, why not make a stuffed white snake for your kids, which can simply sit coiled in your house and invite prosperity. Stuffed teddy bears are one of the most saleable gifts in the market. The simplest reason to for is that the fact they are loved by every body, right from kids to teenage girls. Apart from being used as a playmate, they can be used as show pieces on the bed table or even as a comfy pillow on the bed. Stuffed teddy bears come in various colors and patterns and are not very difficult to make. Stuffed dogs make an interesting and lovely option for kids to play with. Prepared by using interesting and colorful materials, they look so cute and irresistible that no one simply pass by without cuddling them once. These stuffed dogs are not only loved by the kids, but are also a craze amongst the older girls as well. There will hardly be any child on this earth who doesn't like to play with stuffed toys. In fact, these toys make one of the few cherished possession of a young kid. However, with the ever-increasing prices of these stuff toys, not every parent can afford to buy them. So, here we have come up with an easy and less expensive way of getting interesting stuffed animals for your kid - making them yourself. Monkeys are very interesting animals. Their cute activity makes them dear of all. However, as it is not possible to have a real one in your home, you can do with a stuffed replica of the same. Stuffed monkeys are not only charming to look at, but also serve as a smart decoration piece for your bedside table or an interesting hanging on your room plant.